I am speaking at St. Apollinarius Chuch in Napa CA Friday and Saturday. “Raising Kids to Love the Faith” and “Swimming Upstream in a Pagan Culture” After that, some good Napa ? The Christ Our Life Conference invited me to come to the Wells Fargo Conference Center in Des Moines Iowa to give two talks to 10,000 good Catholic folks. I will be joining Matt Fradd and Bishop Baron. Steve Ray here. I am happy to be part of the celebration. After working with Ignatius Press for over 20 years (5 books and 10 movies), I consider them the best Catholic publisher in the country — one that is doing great work in keeping the faithful informed with the best books, movies, educational materials, magazines, news sources and blogs. 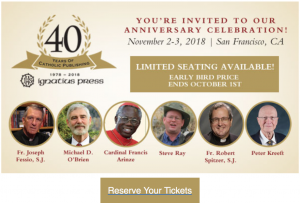 I invite you to join us as we celebrate the 40th Anniver­sary of Ignatius Press! Along with Ignatius Press found­er Fr. Joseph Fessio, SJ, and the men and women of Ignatius Press, you’ll be joining Car­dinal Francis Arinze, Peter Kreeft, Fr. Robert Spitzer, SJ, Steve Ray, Michael D. O’Brien, and Arch­bishop Salvatore Cordileone. We will begin with a dinner and talks on Friday, November 2nd, followed by Mass and a day of speakers on Saturday, November 3rd. We hope you can join us for both! Our 40th Anniversary Celebration will take place at the Cathedral of Saint Mary of the Assumption in San Francisco. Dinner and talks will take place downstairs at the Cathedral’s event center. Arriving in Nebraska! Excited about New Talk! You always hear Steve talking – but here is Janet in a 14 minute description of pilgrimages and what they mean to her and how she views travel, pilgrimages, the Bible and spirituality – from her perspective.